Stay tuned (ha ha, pun intended)! Our new family room with fireplace and built-ins is almost ready to show you. 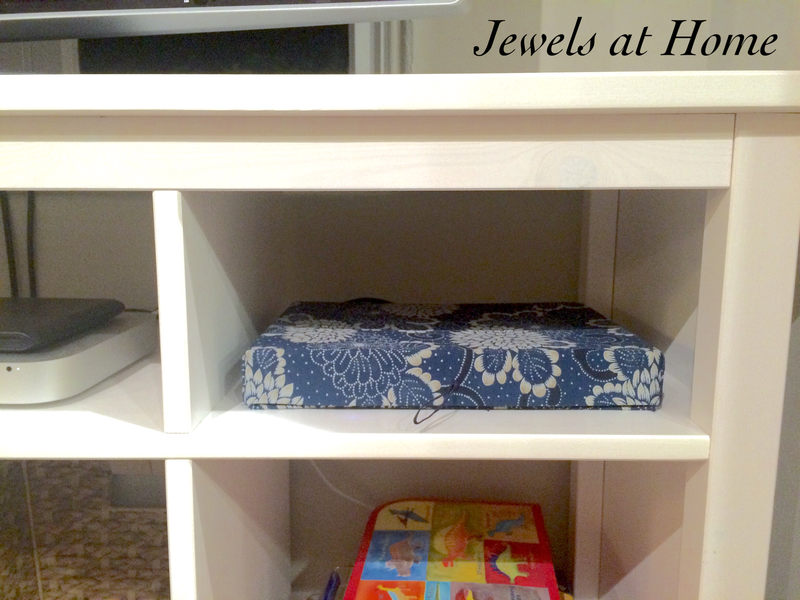 As part of the final touches, I wanted to find a way to hide some of the electronics that are a necessary but not-very-pretty part of a modern family room. 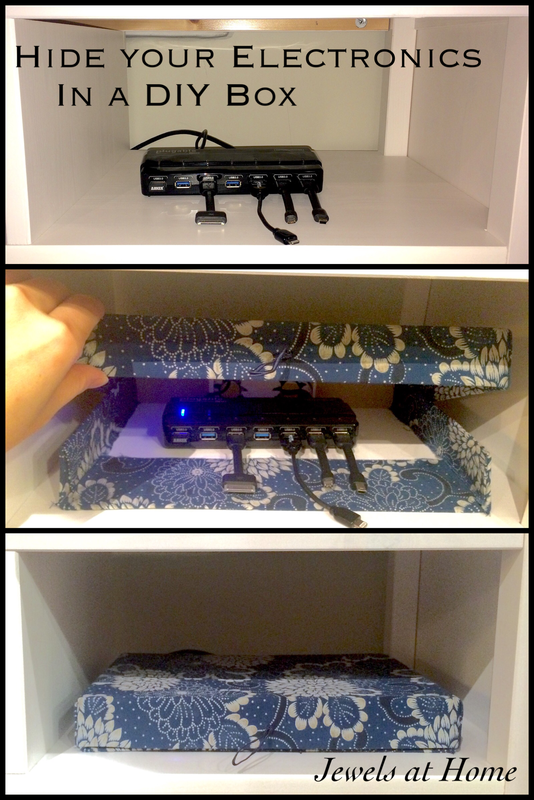 I like this little box I created to hide our chargers! I started with a used gift box that was the right size and turned it into this fabric-covered box. I folded the front of the box flat, so that we can easily plug things in to the charger. In the back, I cut out notches where the wires would go in to the back of the charger. The cardboard was quite thin, so I added some reinforcement to the sides and back. I cut large holes in the back for the cables to go into the back. I wrapped the top and bottom in a single piece of fabric, so that it joins the pieces in the back, and the box is hinged. I also punched a small hole and added a ribbon handle to the front of the box lid. I’ve got another disguise planned for the computer sitting next to the charger, and I hope to show that to you soon! I love this idea…one question/concern I have is do you find the box gets warm when plugged in? Do you unplug the charger when not in use? It is beautiful…and I love that it disguises it! Thanks! We love it, too. I checked before and after I built the box, and ours doesn’t get hot, so it hasn’t been a problem. If you want something with more ventilation, I am in the middle of modifying an old book to cover another electronic component, and that will be more open on the sides and back, so stay tuned for that. Hope you find something that works for you! Oh that sounds great! Can’t wait to see it.